Essex /ˈɛsᵻks/ is a county in England, immediately north-east of London. 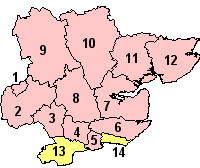 It borders the counties of Suffolk and Cambridgeshire to the north, Hertfordshire to the west, Kent across the estuary of the River Thames to the south and London to the south-west. The county town is Chelmsford, which is the only city in the county. Essex occupies the east of the pre-England Kingdom of Essex. As well as rural areas, the county also includes London Stansted Airport, the new towns of Basildon and Harlow, Lakeside Shopping Centre, the port of Tilbury and the resort of Southend-on-Sea.